Insights and Rants: Backups? Who needs backups? I make backups. Regularly. I have learnt the hard way, and rescued years of data as a result, in spite of two laptop hard drive failures. I have all my emails going back to 2001. Still, in the last two years I have wasted two weeks of valuable programming time as a result of bad backups. Ten years ago I threw away an entire day's worth of intensive programming by overwriting a file. That's when I developed Zippy. It has saved me from countless disasters simply by creating zip file backups on my hard drive. I also use an external hard drive to archive copies of important files, using SyncToy. And I have purchased Acronis TrueImage Home. But what happens if/when this drive dies or gets stolen? It sits next to my desk so it's not exactly a secure backup. Fortunately I am also a regular listener of the Security Now! podcast. So I started hearing about Carbonite, and after my last fiasco I decided to splash out and spend $54.95 (ZAR 431.77) for Carbonite's backup service for a year. And because I used the offer code in the podcast adverts, my subscription is renewable in May 2011. And If I install it on my wife's machine as well I get 50% off by using a link in the purchase receipt. South African readers will probably drool at the screen shot above. So far I have backed up nearly 6GB of data, with another 7GB to go. For most "broadband" users in South Africa that's double their monthly 3GB cap, and wireless/3G users are lucky to have a 1GB cap. Fortunately I have a bigger cap, and it is possible to manage the backup process better to restrict the size of the backup. If you have an "unlimited" data connection, consider yourself extremely lucky. You have no excuse for not doing backups. 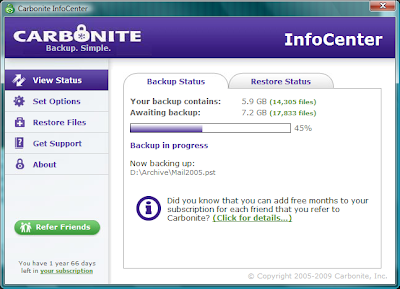 Carbonite is simple to install, easy to set up and works quietly in the background. It just gets on with the job, without interfering with normal work. You can pause it or stop it completely for a while, and restrict the hours when the backup runs. I haven't figured out whether it makes incremental backups of my Outlook data files, but I suspect that it does. Now I can sleep better, knowing that my most important files are also backed up automatically "in the cloud". Update: M-Web has introduced "uncapped" shaped ADSL, so on Saturday I upgraded my R299 5GB account to a cheaper R129 uncapped 384kbps account. Finally SA enters the 21st century. Update 4 April: All the files are now backed up. It took a while but there were some big ones to do, particularly Outlook email archives and database files.